Massachusetts General Laws, Session Laws (Acts & Resolves) & Bills. Legal Research: Print or Online? When doing legal research, is it easier to use online sources or books? Which produces better results? Can you even do it all online, if you want to? For recent legislation, search the Session Laws which are arranged in chronological order. For current bills before the Massachusetts General Court (legislature), click on Bills Search. Sign up to receive a free State House newsletter called MASSterList. For a specific day's legislative information, search the Senate and House Journals. Links to recent news and legislation. All-purpose access to information for Massachusetts residents. Massachusetts' Morning Report from the State House. Legislation, executive orders, staff, cabinets, councils, and commissions, including Judicial Nominating Commission. By subject and by number. Six month arrangement, speeches, daily public schedule. Massachusetts legislature (called the General Court of the Commonwealth of Massachusetts: bills and laws, legislators, budget, hearings, events, committees and more from one newly designed website. General Laws, Bills & Session Laws (includes Acts & Resolves Index by year, 1997-present). To see if a law has been updated since it was passed, search the General Laws by keyword plus year, or by chapter and section of the codified general laws and look for any italicized text in brackets. Check the back of the volume when you are using the print version for the same citation in the pocket part annual update. MASSACHUSETTS GENERAL COURT WEBSITE NOTICE: This is NOT the official version of the General Laws of Massachusetts. While reasonable efforts have been made to ensure the accuracy of the data provided, do not rely on this information without first checking the Official Edition of the General Laws of Massachusetts. If you are in need of legal advice or counsel, please consult a lawyer. From the State Library, 1692-2009. Set the year from 2015 back to 1997. Governor Baker signs onto S.2407. A full range of laws and information information,including an MCAD guide, how-to change your birth certificate, and cases related to the topic of gender identity or expression. Let your voice be heard! Check this calendar for daily hearings regarding proposed legislation. Find out which bills are being discussed. Numbers, Sponsors, Titles and Text of House bills. Numbers, Sponsors, Titles and Text of Senate bills. Visual diagram of the legislative process. One stop for finding information related to the General Court of Massachusetts, our legislative body. St.2016, c.134 (S2407) An Act Relative to Transgender Anti-Discrimination. Fully effective October 1, 2016. Gives transgender people the right to use restrooms or locker rooms consistent with their gender identities, and includes language to provide "legal action [against] any person whose assertion of a gender identity is for an improper purpose." Terms defined with legal merit. How to trace the history of a law in Massachusetts. Understand and engage in the legislative process. Find current and archived reports submitted to the General Court regarding consideration of legislation. Roll calls can be searched and read in the House Journal. Roll call can be searched and read in the Massachusetts Senate Journal. Simplified way to find your topic from the state legislature website. Plan your visit to the State House using this helpful guide. Mobile apps and other enhancements. Tour the General Court of Massachusetts. The Massachusetts Legislature is known as The General Court of Massachusetts. Acts and other resolutions passed by the legislative body are found here. The chapter numbers identifying the acts are entered in numerical order as passed. 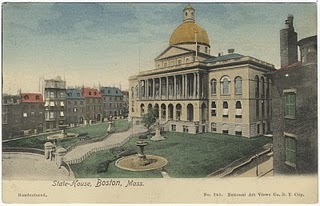 The General Court of the Commonwealth of Massachusetts is one of the oldest institutions in the United States hearing bills and passing laws. Visit the links below to learn how an idea becomes a law in Massachusetts. Listing of League Supported/Opposed legislation. Vintage postcards of the State Library now available through Flickr. Guide to Massachusetts Legislative History. How to find the history, from bill to law. The State Library has the official march and songs of the Bay State. "The Road to Boston", composer unknown, was designated by Mass. Gen. Law ch. 2, § 27. The State Library of Massachusetts holds the most complete collection of Massachusetts state publications in existence, dating to the inception of the Library in 1826, with some earlier materials also available. The Library’s collection includes legislative, executive, and judicial documents, as well as publications from commissions, authorities, and other agencies of Massachusetts government. Many state documents are now published solely in electronic form, while many older documents have been digitized. The State Library permanently preserves and provides access to these resources through its electronic repository. The State Library of Massachusetts supports the research and information needs of government, libraries, and people through innovative services and access to a comprehensive repository of state documents and other historical items. Office of the Secretary of State from the Commonwealth provides answers to your questions about how to make a request for a public record. Massachusetts Senate passes bill to overhaul the public records law. The House passed a public records reform bill in November, and the Senate released its own version of the bill last week. The bill will now go to a committee of House-Senate negotiators to hammer out a final compromise.The House passed a public records reform bill in November, and the Senate released its own version of the bill last week. The bill will now go to a committee of House-Senate negotiators to hammer out a final compromise. It will be the first overhaul since 1973.